California's major population and agriculture centers are far from their sources of fresh water—by design. In our early history, water conveyance was built to stimulate urban growth and convert vast expanses of arid land to crop land. Four major watersheds supply most Californians with at least some of their fresh water: the Sacramento River in the north, the San Joaquin River and the Tulare Basin in the central part of the state, and the Colorado River to the east. Rainfall in the southern Cascades and the Sierra Nevada feed the rivers, lakes, aquifers and wetlands that California's vast water infrastructure captures, stores and distributes. 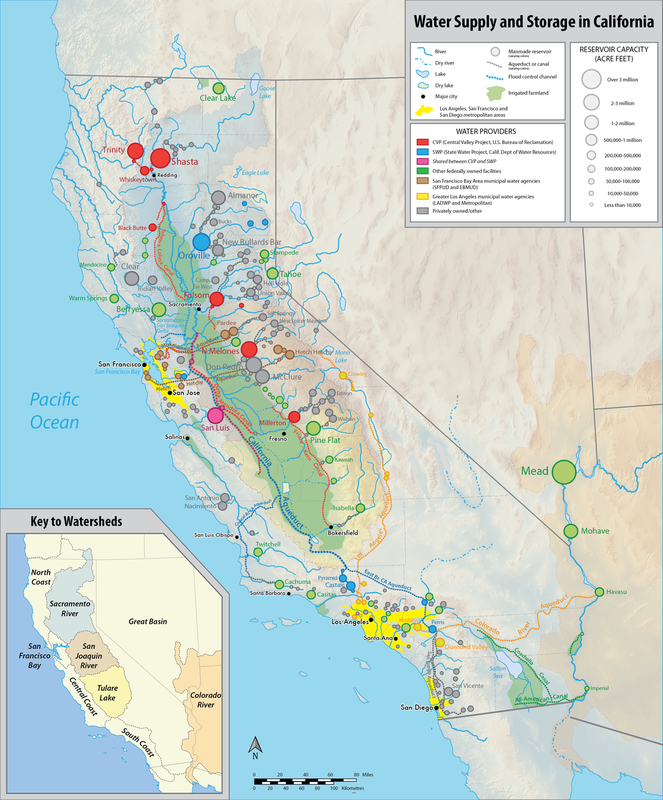 The biggest players in the business of moving water are the federal Central Valley Project (CVP), the State Water Project (SWP), the Colorado River (via the Boulder Canyon Project of the US Bureau of Reclamation), the San Francisco Bay Area municipal water agencies and the Greater Los Angeles municipal water agencies. Municipalities throughout the state contract with these suppliers to supplement their local sources. The single largest source of fresh water for California is the Sacramento/San Joaquin River Delta—known as the California Delta. Water from the California Delta serves half of California's population - over 25 million people. Water from the California Delta enters the CVP and SWP systems east of San Francisco and goes mostly south to the San Joaquin Valley and as far as Los Angeles.